Pretty much every advertising network has more than one site as available target locations. Facebook ads can appear on Instagram. Google ads can appear on Google’s search pages, their various integrated products, and in their publisher network. Even Twitter ads have the ability to appear in a broad network of apps. It’s the Twitter Audience Platform. 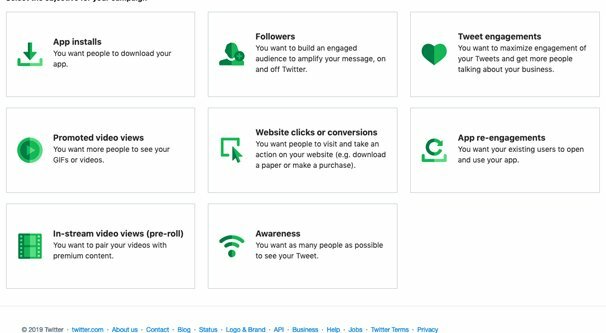 As you may have guessed from the intro, the Twitter Audience Platform is another place your Twitter ads can be displayed. It layers on top of the typical ad placements, like timelines, tweet detail pages, and search results. Here’s how it works. App developers can create their mobile apps and put them up on stores for users to download, just like normal. Since you want to monetize your app, you want to run some kind of ads in it, particularly if it’s a free app. Running ads means you need to choose an app ad network to integrate. There are a lot to choose from! Google’s AdMob, the ever-popular InMobi, the GOWIDE ad network, and others are all options. One such option is MoPub. MoPub is Twitter’s owned app ad marketing platform. When an app developer integrates MoPub into their app, Twitter can start showing adds within that app. The ads can be videos, interactive app ads, interstitials, and static ads. This isn’t a post focused at app developers or publishers, however, so I’m mostly just glossing over all of this. There are plenty of technical details from the developer side that might be relevant, but not for the advertiser side. We advertisers don’t need to know how it works on the back end, we just need to know that it works at all. Advertisers can create Twitter ads like normal. 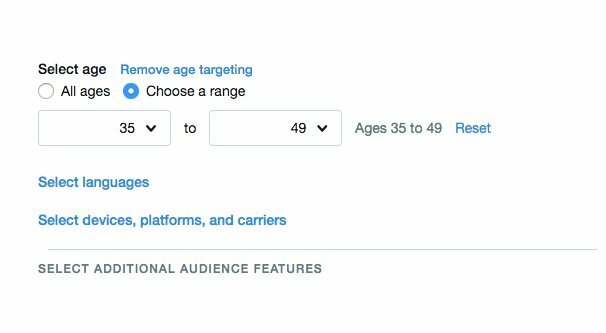 When choosing where those ads should be displayed, you can choose “Expand your reach on the Twitter Audience Platform.” Checking that box puts a couple of targeting restrictions on your ads, but gives you access to the entire MoPub network. I’d say it’s a worthwhile trade-off. What are the quirks and restrictions with using the Twitter Audience Platform? You’re not able to use TV targeting, Event targeting, or Behavior targeting. Basically, specific targeting that relies on a very narrow time frame is restricted. All other targeting options work fine. 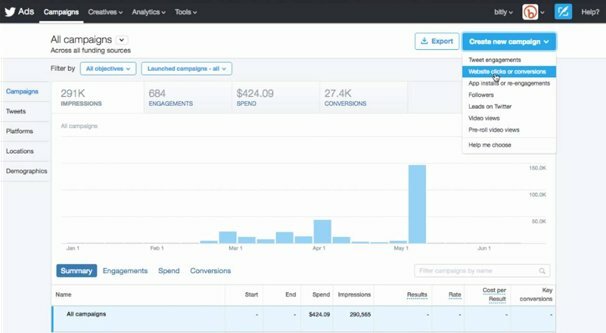 You can view your ad analytics for the Twitter site itself, the Twitter Audience Platform, or both combined. This can be useful to see how one ad performs on each platform in comparison. You still need to register your domain with Twitter’s ads, even if your ad points to an app. Otherwise, it’s basically identical to normal Twitter ads. It’s just an expanded targeting option, after all. A larger audience with a few minor trade-offs that most people aren’t using in the first place? Sign me up! Speaking of, let’s talk about how to actually create these ads. 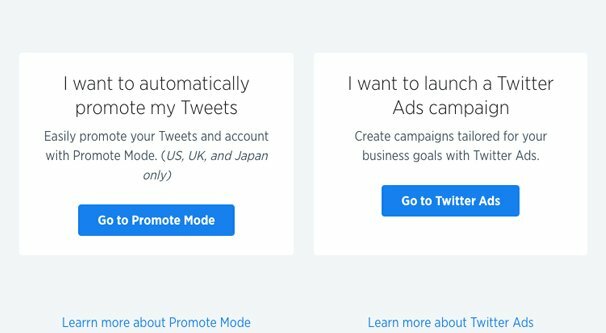 If you’ve never used Twitter ads before, the first thing you need to do is sign up for them. Just visit the Twitter ads portal and opt in. You basically just have to tell Twitter which account you want to use to promote ads. Make sure you’re logged into the right one when you visit the link above. Twitter will give you two options. Do you want to set up a promotion campaign that will automatically promote your existing tweets, or do you want to launch a new ad campaign that will give you complete control over new ad creatives? Specifically in this instance, you want the second option. The first option is like boosting a post on Facebook: you’re taking existing content and turning it into ads. This can work just fine for on-Twitter promotion, but we’re talking about the Twitter Audience Platform, not just Twitter-the-website itself. Choose the second option, which takes you to ads.twitter.com. Twitter will probably ask you for some basic information here, if you’ve never used Twitter ads before. If you’ve used them before, skip to the next step. The information is basic. Twitter just asks what country you’re in and what your time zone is. This helps them choose your currency for bidding – or lets you pick if you’re in a region with several effective currencies – and helps them customize your dashboard for your use. It’s important to note that you cannot chance your country or time zone later. I don’t know what Twitter does when someone moves to another country. I guess you just have to use the old country, unless they can change it with a support ticket. It’s never been an issue for me. Twitter may also ask for billing information. Sometimes you need to add billing information right away, while others you can wait until you have an ad ready to go and need to start paying for it. Either way, without adding billing information, you can’t run an ad, so go ahead and add something. If you’re not sure what payment options are available, Twitter has a pretty good help article about the subject. They’ll accept credit and debit cards, but do not have other forms of payment as available options. Some cards are limited, like JCB cards only work if you’re paying using Japanese Yen or United States Dollars. Most people gloss over this, but we live in a world where large-scale data breaches are increasingly common. I highly, highly recommend that you add security to your ads account. After all, you have credit card information stored in this account, you don’t want someone else swooping in and abusing your info. In addition to using a strong password – and not writing that password down anywhere – you should use the various security features Twitter makes available. Use two-factor authentication. 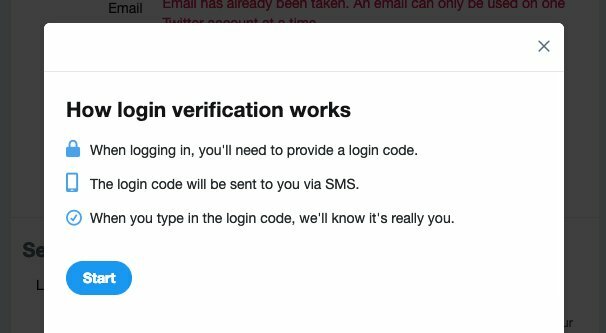 Twitter calls this “login verification” but it’s the same concept. In order to log in, you will need a code provided to a mobile phone or security key. This helps prevent unauthorized access. Enable needing a verification code to change your password. This way no one can hijack your Twitter account without also having access to your email or another security method. Periodically scan Twitter for instances of phishing copies of your profile. People often try to scam the followers of large accounts by creating mimic accounts. Elon Musk is a common target; check the replies to any of his tweets and you see Elon clone accounts trying to scam cryptocurrencies. If you find any such accounts, report them to Twitter as impersonators and scammers. Additionally, you want to make sure your own Twitter domain is up to snuff. Make sure you have a recognizable, branded profile photo, display name, and bio. This will help make sure people can find and trust your profile, as well as make it a little smoother when you’re waiting for ad approval. When you end up at ads.twitter.com – and you can go back there if you left to secure your account – you will be asked about the ad campaign you want to run. Since we’re focusing on a Twitter Audience Platform ad, you have several options to pick from. Your options are: App Installs, Followers, Tweet Engagement, Promoted Video Views, Website Clicks/Conversions, App Re-Engagements, In-Stream Video Views, and Awareness. Among these, you’re most likely going to want to pick app installs, website conversions, or app re-engagements. Remember, your target audience is people who are using another app already. They’re seeing your ad as a video or interstitial, not an embedded tweet or something similar. I’m going to go with the least complicated option and just do website clicks for the moment. Obviously, you can choose whatever you like to follow along. Remember that your ad objective will have an impact on how much your ad costs. Website clicks are cheap. Video views tend to be cheap. Engagement and followers are more expensive. Awareness is trivial. It all depends on targeting as well, of course, but it’s a starting point. The next window will ask you for information about your campaign. Fill in a name, and choose a budget. You will have to set a daily budget, and you can optionally set a total budget as well. 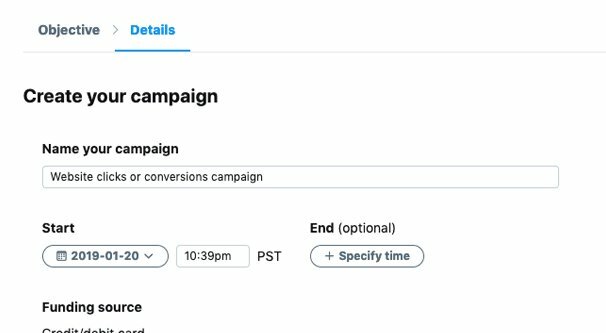 You can also choose whether your ads run continually until you hit your budget caps, or if you want to start and stop your campaign on specific dates. You’ve created your ad campaign, but all good ad systems allow a lot of subdivision, and Twitter is no different. 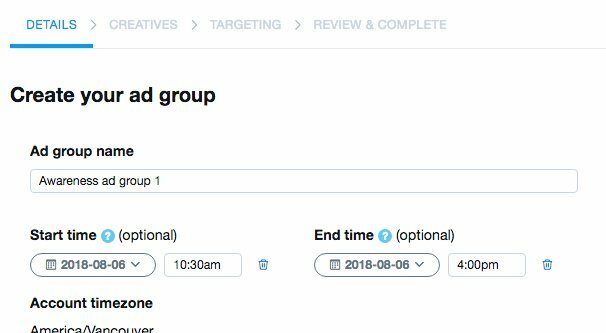 You can now create ad groups, and within those groups, individual ads. You don’t have to create more than one ad group, but it’s highly recommended for broad-scale split testing. You can have three different ad groups, each with similar ads but different targeting or budgets or creatives, and see which works best. Your ad group needs a name. You can specify start and end times for it, and you can set a specific budget for the ad group individually as well. 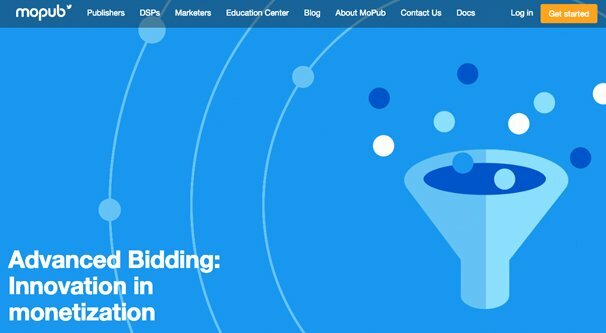 Choosing your bid type can be a complicated decision, but for now, just leave it at automatic. Choose what specific metric you want to optimize your ads for – such as clicks or conversions – and choose a key metric of you want. Some of this might involve having a Twitter tracking pixel on your website or in your app, so be aware of that. If you want multiple different ad groups, you can clone an existing ad group, or you can add a new ad group. Once you have saved your first ad group, go to make a new ad group and click “clone ad group” to copy it with a few changes, if you want. At this point you will be asked to add in some ad targeting. You can choose specific audiences and custom audiences you’ve added to the ads system before – if you’ve done so – and you can choose to “expand your reach by targeting similar users.” This is basically the lookalike audience from Facebook, if you’re familiar with that. Targeting options include gender and age range specifics. You can also choose location targeting by geographic region or zip code, language targeting, platform and device targeting, and targeting by device carrier or even OS. At minimum I recommend choosing targeting restricted to your country, and indeed Twitter has this as a default. You can then specify keyword and audience features, and you can retarget people who have engaged with your tweets in the past. Once you have targeting options set, you can choose your ad creatives. You can pick one or more existing tweets, or you can compose new tweets. You’re still limited to tweets, but you can make media tweets by uploading videos, animated gifs, or images to be the central focus of your tweet. Treat the tweet like an ad image and ad copy, just in a Twitter format. There’s a sidebar in the creatives section titled “where your promoted tweets appear.” This is the important part. You by default are required to have timelines active, but you can enable or disable profiles and tweet detail pages, search results, and – most importantly for this article – the Twitter Audience Platform option. Since we’re aiming for the audience platform, you want to make sure that option is checked. You will need to specify at least one category that describes your ad. It can be simple like “card games” or complex like “car culture.” There are a lot of categories, and the choice of category helps with placement in appropriate positions in the publisher network. Add in the domain of your website in the verification for the ad, and you’re good to go. Save your ad, review the details, and set it in motion. Once Twitter reviews and approves the ad, it will run so long as you have a budget for it. Good luck! Instagram vs. Twitter: Which Follower is More Valuable?